Heather Buckley worked as a graphic designer and creative lead for thirteen years in the New York advertising world before transitioning to live her life-long dream of a career in the Film World. She has worked for years as a journalist for Dread Central, Diabolique, Fangoria and Vulture. She worked in the makeup department on Billy Pon’s CIRCUS OF THE DEAD, and then as Makeup FX Shop Supervisor on The Booth Brothers’ DEAD STILL (and, under prosthetics, played a featured ghoul—film soon to be released by Sony Pictures) and Ted Geoghegan’s WE ARE STILL HERE (MPI). She is currently a Blu-Ray Special Features Producer for Red Shirt Pictures, Severin Films, Kino Lorber and Liongate (Vestron) working on documentaries (over 100 and counting), which include THE THING, 8 MILLION WAYS TO DIE, BARTON FINK, THE LONG RIDERS, SAW 10th Anniversary reissue, and ARMY OF DARKNESS. 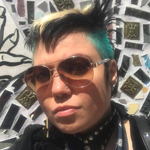 She is also one of the Producers on Jen Wexler’s The Ranger for Glass Eye Pix and Hood River Entertainment a punk rock horror film coming to a pit near you.